This iguana has a long body covered with soft leathery scales, a long tail and short legs. Its hard, long tail is used as a weapon and for balance when climbing. It has a greenish-gray color and can change color slightly (but not nearly as well as some lizards, such as chameleons). Female and juvenile male iguanas are a much brighter green than an adult male. It has feet with five very long toes with sharp claws on the ends, used especially for climbing. The iguana has a row of spines that extend along its back from the base of its head all the way to the tip of its tail, descending in size from head to tail. Housing for green iguanas can vary on the age of the iguana that is being housed. The common Green Iguana is mostly arboreal so they need lots of vertical space to climb and help build and maintain their leg muscles. Hatchling green iguanas can be housed in a 20 gallon tank or enclosure; however this will not hold them for long. We suggest using wood to frame in the enclosure and using a few vents near the top or having mesh on the door to keep most humidity in but allow air flow as well. Adult green iguanas need an enclosure at least 1.8 meters tall by 1.2 meters deep and 1.2 meters wide (6 x 4 x 4 feet). Remember this is the minimum size that we recommend for adult green iguanas but larger is preferred. With hatchlings starting out in a 20 gallon sized tank/enclosure they will work their way up in size as they grow. As an owner of a baby green iguana you need to be prepared to continue to increase the size of their enclosure until they are full grown. Depending on where you live you may also have a permanent or summer only outdoor enclosure for your green iguana. If you live in a warm climate and this option is available to you, it is (when done properly) recommended. If an outdoor enclosure is what you would like to build please keep a few things in mind. For one, you must have an enclosure that is strong to withstand winds and have a large sheltered area where the iguana can hide safely in poor weather. Secondly you should have a backup enclosure or area set up indoors if there is extreme weather or damage to your outdoor set up. Lastly you need to build your enclosure out of proper, strong materials. This will ensure that your iguana cannot get out and predator animals cannot get in to your iguana. Hide boxes can have a couple of benefits for your green iguana such as shelter, comfort and a place to sleep. If you have a flighty iguana you can put some decoration in the enclosure such as branches and foliage that your iguana can climb around on and still hide a bit. Try to avoid the hide box in this case because the iguana will stay there and won’t get the exercise, and much needed UVB rays or basking heat temperatures. Many iguanas will use hides to sleep in, especially if he/she wants to go to bed before you turn the lights out for the day. If your iguana wants a place to cool down for a bit to help regulate their temperature they may use the hide also. For iguanas that are housed outdoors the hides are important so they can get out of the sun and have protection from the weather. A common substrate used to help make an enclosure look more natural is normal top soil (no added plant growth vitamins if bought at a store) or you can purchase substrates such as coconut fiber or mosses at any pet store that carries reptile accessories. If you have a female green iguana, when they come into breeding season they will have very strong instincts to start to dig. You can mix sand and top soil together and moisten it so it holds its form when dug in. If you are using this mixture because it has sand in it, it’s best if only used during this time and not throughout the whole year. The biggest thing to keep in mind is to have a substrate that will hold humidity (or have other options for humidity) and no large pieces to keep impaction risk at the lowest. To avoid impaction, it’s best to stay away from wood chips, sawdust or sand type substrates. Lighting is one of the most important aspects of any reptile care. Proper lighting vs improper lighting can mean the difference between your reptile living a long happy and healthy life vs a short life filled with complications. Just like other species of reptiles green iguanas need both a UVB and heat source in their enclosures. Again if you have an outdoor enclosure for your iguana you will not need either of these lights, but it’s best to have a pair at your house for emergency situations. It’s always better to be prepared. Green Iguanas basking spot temperatures should be between 32-35 °C (90-95 °F) with the rest of their enclosure staying around 29 °C (85 °F) throughout the day. During the night their enclosure temperature should be around 27 °C (80 °F). The size of the enclosure and the distance between the basking spot and the heat source will play a part in how strong of a heat bulb you will need. Another thing to keep in mind when it comes to the temperature inside of your enclosure is the location in the room. For example if you have an enclosure near a window that gets direct light most of the day, depending what the enclosure is made of it can increase the temperature inside and make it unsafe for your iguana. When it comes to UV lights it’s very important to keep your bulbs up to date and positioned properly. If you are using the fluorescent (long tube) reptile bulbs there are many brands to choose from but there are also two types of bulbs. We recommend using the T5 bulbs instead of T8. When you are using the larger T8 bulbs your reptile must be within 12 inches of the light in order to get optimal ray exposure as opposed to the T5 your reptile can be twice as far and still get the much needed rays from the bulb. This means your reptile can receive the rays while they are away from the basking area. The one you will need for your green iguana is the 5.0, this bulb was made for tropical and sub-tropical reptile species. If you have an outdoor enclosure set up you already have free access to the best lighting your lizard can get, the natural sunlight. As long as you are not using a fine mesh on the top of the enclosure as it can block up to 50% of the rays your iguana will be perfectly healthy outdoors in the right climate. The T5 bulbs may be a bit more expensive but they can last for a year before they should be switched out in compatison with the 6 months lifetime of T8. Green iguanas should have a water tub in their enclosure that is big enough that they can get in to have a soak. Green iguanas are great swimmers and are right at home. Another benefit to having a large soaker tub for your iguana is that it helps keep them hydrated as they will drink from it as well as soaking. Their water should be changed at least once daily to keep fresh clean water in the enclosure. If you have a soil type substrate you may need to change it more frequently as your iguana may run around and the water will become dirty very quickly. Lastly with their water dishes, it’s very common that your iguana will use it as their bathroom. Many iguanas will go into their dish for a soak and use it to go to the bathroom in before they get out. This water should be changed as soon after as possible to make sure your iguana doesn’t drink from it after. You can also have a smaller drinking only dish as well if you have a very large enclosure. Since the green iguana is a tropical lizard it does need moderate to high humidity levels in its enclosure. Green iguana enclosures should be about 80% humidity. There are a few ways this can be achieved. The easiest one is to have a substrate that can hold moisture. If you have moist bedding in the enclosure it will raise the humidity level in your enclosure to a happy level. If just the moist substrate isn’t raising it quite enough you can add in either a cool mist machine or a fogger to keep the levels up. Another thing that is recommended to keep your iguana hydrated and happy is misting them lightly with a spray bottle a couple times a day and giving them warm baths at least 2-3 times a week. Green iguana diets have come a long way in the past 20+ years. Green iguanas are strictly vegetarians; this means they should not have any animal or insect protein in their diets. There is a large variety of greens and vegetables that you can feed your iguana. However a lot of food you may think they can eat should only be fed on occasion (treats) such as grapes. Their diet should consist of about 45% greens, 45% vegetables and less than 10% fruits. There is a great food chart on the Green Iguana Society website that has a long list of foods that you can feed your iguana all the time, some of the time and what foods to stay away from completely. 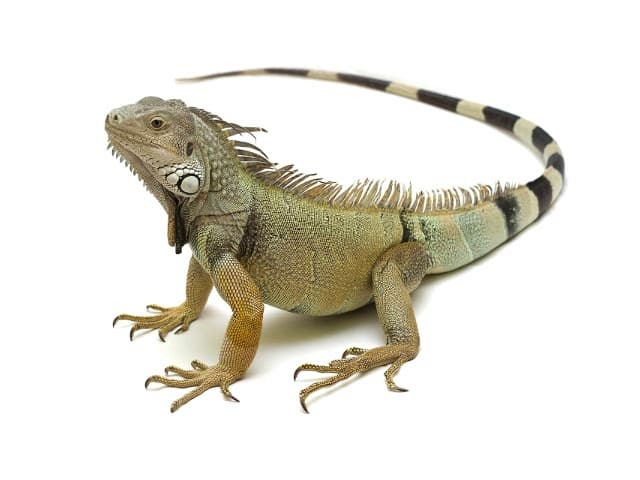 Ontario Iguanas recommends that iguana owners refer to this site for more detailed information on green iguana diets. It’s good practice to sprinkle a bit of calcium powder with Vitamin D3 on their salads a couple times a week to make sure they are getting everything they need. You can purchase this at any pet store that sells reptile supplies. Handling your green iguana can be a frightening and amazing experience depending on the behaviour, size and age of your green iguana. When you purchase a hatchling green iguana it’s important to give them about a week to get accustomed to their new environment before handling them too much. Green iguanas are a prey species so they have very strong fight or flight instincts so this can cause a couple problems. When they are hatchlings, or really small, they are going to choose the flight instinct as they don’t have the mass to protect themselves from a predator (yes, a new iguana pictures you as a predator). This is why when you stick your hand in your baby iguana may go ballistic running around their enclosure and possibly injuring themselves. One important thing to remember about when you pick them up is your grip. As I said before they are a prey species so when you grab them and you’re physically holding them in a closed hand, this is very stressful for a green iguana even if they aren’t fighting you about it. The best way is to allow them to sit on your arm, hand or shoulder freely. It’s important to not get discouraged when training your green iguana as it takes time and patience for them to come around and trust you. For informative training videos about working with a flighty or aggressive iguanas, please check out Ontario Iguanas YouTube channel. Their enclosure should be cleaned on a regular basis. Ontario Iguanas recommends that you should tidy up and change the water daily and once every week give it a full cleaning. If you have a soil type substrate it will need water added to it as it loses it moisture. This should happen at least once a week and may need more depending how fast it loses the moisture. As your green iguana gets older they will start to shed less often. A healthy hatchling green iguana will shed about once a month as they are growing fast. As they get bigger it will become less often, every couple months, down to 3-4 times a year and when they get full grown they may only go through a full shed once or twice a year. Iguanas don’t shed like snakes, all at once, they will shed parts of their bodies at times and it comes off in pieces rather than one large chunk. It is important that your iguana is hydrated and the humidity is where it is supposed to be so that your iguana doesn’t get any stuck shed. If you notice your iguana is going into shed you can start misting them more than you normally would to help them out but not to the point where they are soaked all day long. The most common health problem that is seen with green iguanas in captivity is MBD (metabolic bone disease). This is caused when the iguana’s body doesn’t receive enough calcium, vitamin D3 or a combination of both. Green iguanas in the wild get their Vitamin D3 from the sun but in captivity they get it from their UV lights as well as their calcium supplement for their food. MBD is caused when they body is in a calcium deficiency and starts taking needed calcium from their own bones. The reason Vitamin D3 is needed for this process is it’s responsible for allowing the calcium to be absorbed into the body. You can have the proper amount of calcium in a diet but without the Vitamin D3 the body cannot use it properly. Phosphorus levels also play a part in the absorption of calcium in the body. Their diet should be 2:1 Calcium to Phosphorus ratio. When the phosphorus levels are too high it binds to the calcium and makes it unusable for the body. Secondly, kidney failure or also known as Renal Disease is common in iguanas. This can be caused by a number of things, from processing too much animal or insect protein, not high enough humidity over a long period of time and a poor diet. Both kidney failure and MBD can be completely avoided if you give your iguana the proper lighting, diet and humidity levels. A good method to always be checking the hydration levels of your iguana as you are cleaning their enclosures is have a look at the urates (creamy liquid part) when they go to the bathroom. A healthy green iguana will leave a solid/soft stool mixed with clear liquid that looks like water with some creamy white substance as well (urates). If your iguana is hydrated the urates will be bright white, if the iguana becomes dehydrated the urates will start to turn a pink colour, then into a bright orange as they become more dehydrated. It may sound gross but for your iguanas health its best to check their urates while you clean and adjust their enclosure conditions accordingly. With everything in check you are bound to have a happy and healthy green iguana.